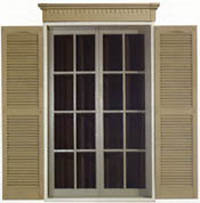 Mid-America's popular style of standard Louver Shutters. Available in two widths. 14 lengths, and 16 designer colors plus paintable units. 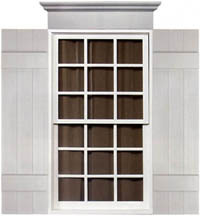 These custom Louver Shutters are available in a variety of styles to match a home's exterior. Available in 13 widths, a wide range of lengths, and 18 designer colors plus paintable units. Single Width or Double Width. Cathedral Top or Straight Top. 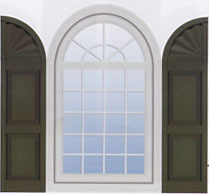 Center Mullion, Offset Mullion or All Louver construction. Mid-America's most popular shutters. 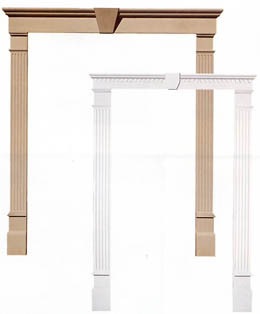 Available in two widths, 14 lengths, and 16 designer colors plus paintable units. 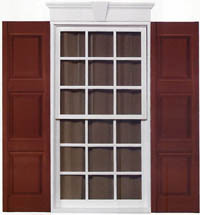 These Raised Panel Shutters can be ordered to match a home's unique exterior. 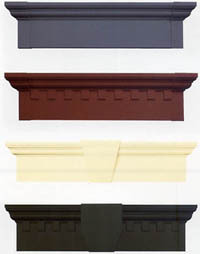 Available in 9 widths, a wide range of lengths, and 18 designer colors plus paintable units. One-, Two- or Three-Panel designs. Equal or Unequal size panels. Mid-America's Board-N-Batten™ shutters come in eight widths, a range of lengths, and 18 designer colors plus paintable units. Two-, Three-, Four- and Five-board styles. 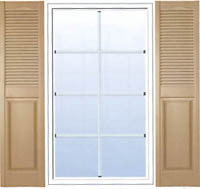 Four-board Joined shutter also available with an archtop. Cut to your specified size (in 1/4" increments). Cut at the ends with End Caps welded in place. Choose the crated look of a detailed dentil profile or a more simple flat panel profile. Available in 6" or 9" height, a range of widths to fit up to a double car garage, and 22 designer colors plus paintable units. Cut in the center with a Keystone. Can be used with a 6" or 9" Header and fits door openings up to 102" high.